Our DUROWALL™ and PAC-WALL® Sidewall Belting has a proven track record spanning more than 30 years, and Apache has provided thousands of corrugated sidewall belts to the food, recycling, agricultural, metals, steel, cement, energy, and construction industries. Supported by our experienced and skilled teams, we work with customers to find the right solution for their unique application — no matter how large or small the conveying needs. As one of the largest conveyor belting fabricators in North America, Apache is dedicated to providing first rate service and dependable products. Apache offers two types of corrugated sidewall belting — DUROWALL™ and PAC-WALL®, and our exclusive sizing program can engineer a sidewall belt for any system. Mills, smelters and foundries have been proving grounds for our sidewall belting. Thousands of belts in use today are proof that they work hard and work tough. As Apache's flagship brand, our Durowall sidewall belts utilize state-of-the-art hydraulic presses to provide optimal adhesion and performance. Quality materials, precise work instructions, and attention to detail are standards — every belt is fabricated to ISO standards. Cross-rigid base belting helps deliver material in an efficient, cost-effective manner for applications that may challenge standard belts. That means a more efficient system without worry of belt failure or downtime. The belting is also designed to eliminate bowing at the upturn and reduce sag on the return. Our cross-rigid belting provides exceptional lateral stiffness while retaining the longitudinal flexibility required by conveying applications. Customers can choose oil-resistant, heat resistant, and black standard rubber covers. All of our heavy-duty corrugated sidewalls are made of high-tensile natural rubber for added flexibility and toughness in order to withstand cutting, tearing, and abrasion. They’re available in heights from 1" to 12", and are manufactured in a variety of compounds, including: high temperature, oil-resistant, black standard, MSHA, PVC, and polyurethane. Our lightweight Durowall sidewall belting is your problem solver for light-duty, steep-angle conveying. Apache's sidewall belting is popular for operating in confined areas, particularly when products need to be elevated quickly. 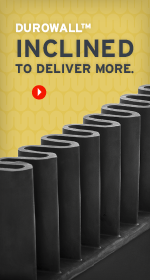 It is offered in polyurethane, thermoplastic, and conventional rubber compounds for belting, cleats, and sidewalls. These belts are suitable for applications requiring FDA/USDA/3A certifications, oil resistance, and anti-static properties. Belting components for lightweight are attached to base belts by hot air, high frequency (HF) welding, conventionally, or hot bonded for rubber components. The base belts are engineered to provide the features needed for maximum performance — transverse stiffness prevents bowing at conveyor transition/change of direction points, while also remaining flexible in the longitudinal direction to negotiate small pulleys. Polyurethane corrugated sidewalls are available for food-grade requirements, and provide consistent dependability. Black rubber sidewalls are used when more durability is needed or in applications that require a more robust construction.